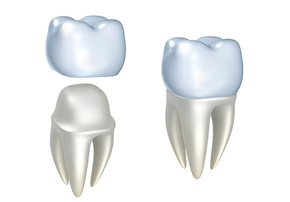 Crowns are one of the methods by which teeth can be rebuilt. If you have a tooth with extensive damage or decay, and a filling would not be appropriate, your dentist may recommend a crown. The tooth is prepared and the crown then covers the damaged tooth to prevent further decay. Crowns can be metal, metal covered with porcelain, or entirely porcelain. The material chosen depends on where in your mouth the crown is needed; for example, crowns that are completely metal are normally only suitable for back teeth. Cosmetic crowns for the front teeth can be made entirely of porcelain for a more natural appearance. The most natural looking crowns are EMAX pressable ceramic crowns and avoid the dark edges of traditional crowns. These are only available on a private basis. Veneers are a thin layer of porcelain that glues onto the existing tooth. They are about as thick as a fingernail, but still require some tooth preparation. They are less destructive to existing teeth than crowns.